Invite Spring to your Body, to Your Life! I believe that nothing happens by chance. Everything that happens to us has its purpose and meaning. 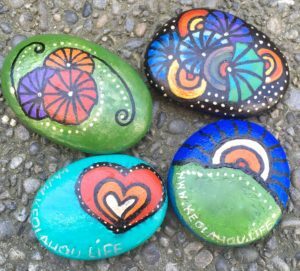 Some time ago I felt I had to paint 4 stones/invitations and leave them in various places in Christchurch. So I did. If you hold one of them and read these words, they are right for you! I invite you for the special spring 2.5h Lomi Lomi Nui massage ceremony. Usually, I do not do such, but this time there is a special occasion. The new numerological year just begins. Everything is flourishing and comes back to life after the winter. My offering for you includes also Tarot Cards reading for this special time. Everything above in an ordinary price of 2h massage session ($200). I wonder if you will follow this invitation and we will meet shortly or maybe you will give this stone to someone else? Call me 0 275169772 or write an e-mail iza@keolahou.life , to make an appointment or just tell me how you found my stone. If you haven‘t found one of my stone invitations, and you like my spring offer that’s fine too! Just share this link on your Facebook profile and contact me to book your spring special session.